IBC media, the creators of the International Blockchain Congress announced the launch of Genesis hack - the world’s biggest blockchain hackathon - at the 10K NASSCOM Start-up Warehouse in Bengaluru. Genesis Hack aims to promote and grow the number of blockchain developers in India. With over 6 million trained software developers, India has the potential to be a blockchain powerhouse, and the developer community plays a privotal role. 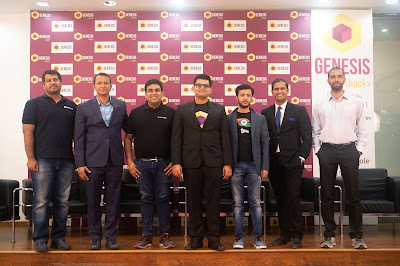 The launch event of Genesis Hack saw several prominent blockchain industry personali-ties like Abhishek Pitti, CEO of Nucleus Vision, Amit Kanodia, CEO, Host and Abhinav Ramesh, CEO of Murmur, among others. Other attendees at the event included develop-ers and participants who came to witness and support the launch of the biggest block-chain hackathon in the world. Genesis Hack is co-hosted and supported by leading industry experts who share the vision of seeing India become one of the biggest block-chain centres in the world - Nucleus Vision, XDAT, Host, Nasscom 10k startups, Spring-role, Murmur and Eleven01. Genesis Hack is a blockchain hackathon that aims to propagate blockchain technology in India.. With the growing need for blockchain talent in India, Genesis Hack aims to bring together over 65k developers to compete against each other for a cash prize of over Rs 1 Crore. The participants will be tested through three major tracks that involve building a blockchain protocol, dApps, and building security solutions for blockchain infrastruc-tures. However, the cash prize is not the only incentive; the participants will also be exposed to India’s entire developer community as blockchain-ready. The hackathon will soon open registrations for its participants and provide them with ample time and mentorship to build their projects. As its name suggests, Genesis Hack is going to set the precedent for the blockchain revolution in India by nurturing and chal-lenging a potent developer community. The present state of affairs in India is favouring the adoption of blockchain technology at industrial and government capacities. However, the lack of blockchain developers will set back the intended progress that needs to be made in order to make India block-chain-ready. “There are several use cases for blockchain technology across several industries,” commented Abhishek Pitti, CEO of Nucleus Vision. “But to scale up, we need engineering talent to build and maintain blockchain infrastructures. An event like Gene-sis Hackathon can help promote the need for more blockchain developers,” he added. Additionally, there are very few blockchain hackathons that give engineers, blockchain enthusiasts and developers the means to contribute to the industry and get inducted into this small, up-and-coming developer community in India. Presently, India has about 6 million engineers who are capable of delivering a solid throughput for the blockchain industry. “As a large-scale event that brings together developers from all over India, Genesis Hack will set the precedent to enable India to solve the biggest blockchain problems in the world with a well-equipped workforce,” said Rama Iyer, President of Elev-en01.